When you think of Pilates, washboard abs and classes full of flexible dancers may come to mind. But Pilates is about more than flat stomachs. People of all fitness levels—men and women—can benefit from the power of Pilates. The practice calms the mind, prevents back pain, strengthens the core, and improves focus, posture, balance, and stability. Eric Clothier, Asphalt Green’s Pilates guru, shares one of his favorite exercises you can do at home or in the gym. Benefits: The swimming exercise stretches the soft tissues of your shoulder joints and lower ribs while simultaneously strengthening your back. Building a strong foundation improves athletic performance and allows you to enjoy everyday activities—walking, running, biking, shopping, cooking—longer in life. 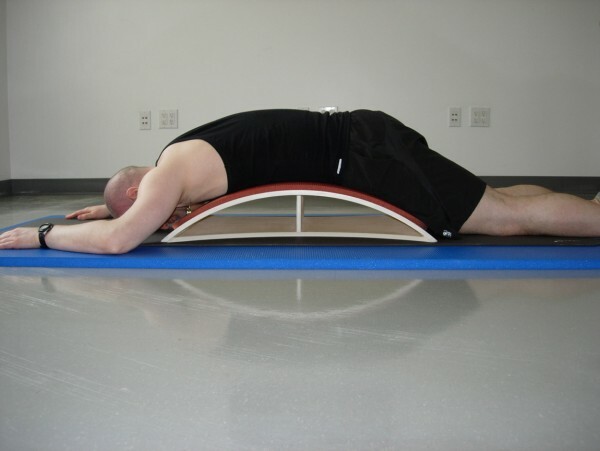 Starting position: Lie face down with your belly over a Pilates barrel, cushion, pillow, or folded exercise mat. Rest the middle of your forehead on the ground or mat. Extend your arms overhead, shoulder-distance apart, palms down. Extend your legs straight out, hip-distance apart with your ankles placed comfortably on the floor. Focus on your breath, inhaling through the nose and exhaling through the mouth. Action: Inhale, then, without shifting your torso, exhale while reaching your opposite arm and leg away from each other. If your joints are flexible, your arm and leg will come off the floor. The non-active arm and leg should remain on the floor. Your forehead can either rest on the floor or lift when your arm rises. Inhale, then return the active arm and leg to starting position. Exhale, and repeat on the other side. Complete eight to 10 repetitions. Lift only the arms or only the legs. Lift the arm and leg on the same side. Adjust your breathing pace. Breathing slower and deeper requires slower moment, which focuses on endurance, while taking quicker, shallow breaths results in faster moments and focuses on coordination and balance. Try inhaling for five counts and exhaling for five counts, moving the arms and legs in coordination with your breath. Complete 10 repetitions. 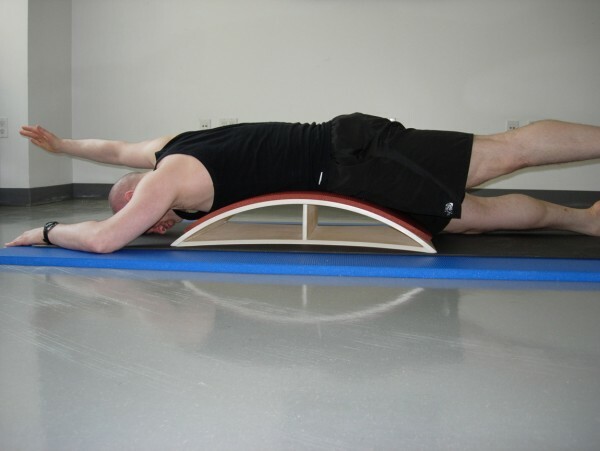 If lying on the barrel or prop is not comfortable, the exercise may be completed on your hands and knees. Your wrists should be positioned under your shoulders, knees perpendicular to your hips, and your spine in neutral position, gazing forward. Level Two: Start lying with your pelvis on the apex of the prop, as opposed to your belly, to fire up your core. Level Three: Begin with your arms and legs off the floor, reaching toward opposing walls. Only your hips should be touching the supported surface. The spine may arch further than in level two, increasing your range of motion.